Look what wandered into my email!!! Now this is remarkable because of the quilt pictured in the ad! Yup, you guessed, that is my April Sweet Pea Table runner. You can see the ad online here. 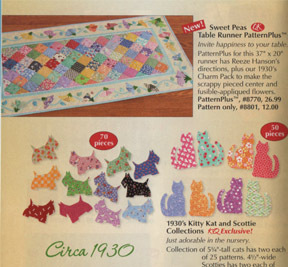 Keepsake Quilting is selling the pattern along with a pack of 30's repro charms as a "Pattern Plus." You can get the pattern (without the charm pack) from my website. Psssst: Here is a secret just for my blog readers. 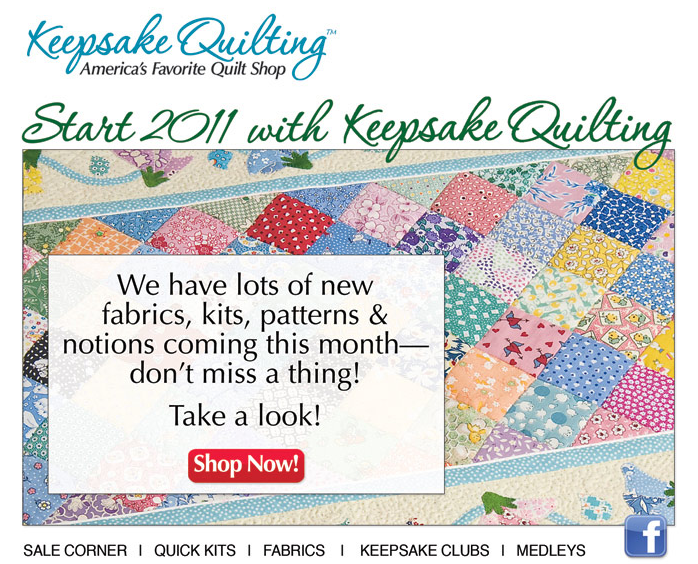 Type in "Spring Sale" when you check out from my web site and get 15% off your pattern purchase. Sale is good through tax day, April 15! I wish they would tell me they were going to do that so I don't get so stunned when this sort of thing happens. It was like being on the cover of Quilter's World this month. I didn't know till I got magazine and saw it. . . .Blam!!!! 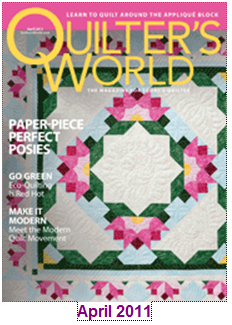 The April issue of Quilter's World is on news stands now! So now that I have burned off that adrenaline it is back to taxes. Oh my. 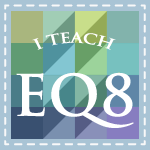 I am learning how to use Quickbooks Pro so that NEXT year at tax time, I am not going through stacks and piles and bags and boxes of paper, reciepts, bills, invoices, and used luncheon napkins to figure up my sales and expenses. I am THIS close to bagging up the whole mess and sending it to my friend Christi in TX (who does taxes for a living) with a note that says HELP!! !﻿ Christi. . . do you make house calls???? To Kansas?????? I have really been intrigued with mosaic tiles as inspiration for quilts. There are several great books out there that develop this theme in amazing designs. 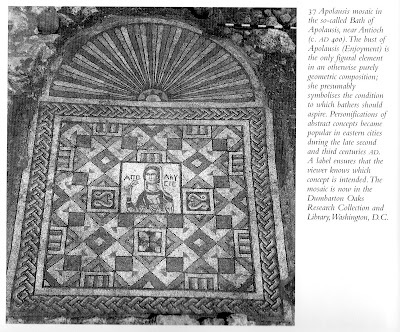 I found an old book on antique Roman-influenced mosaics and wanted to play with several ideas. 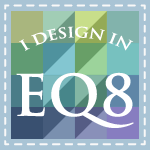 I have discussed this before in my blog and shown a few designs I came up with. My interpretation of this mosaic as interpreted in EQ7 is starting to come together. These are the sashing blocks that run diagonally across the quilt. I am using the Stonehenge fabric by Northcott to make the blocks. They really look like stone. These are the primary blocks that are in the middle of the quilt. I left out the bust of Appolausis and replaced her with more primary blocks. Then I made a few blocks to connect the sashings and border the sashings on the outside edges. Here is a section of the quilt on the design wall with one primary block, 4 sashing blocks and four connector blocks. It is starting to come together. I got the top put together at retreat this past weekend. This shows the first two borders added and the braided border applied to one side. I put on another braided border last night and when I have the rest of the borders done I will post another picture. While on retreat, I also put together a BOB -- Bag of Blocks. This is a swap I invented after accumulating many many bags of blocks from swaps I had participated in. Several of us in similar situations (many bags of blocks with out ideas about how to set them) do a BOB swap. We exchange bags of Blocks (BOBs) and devise a setting and put the top together. We send it back to the original block owners and they have to quilt and finish it. I received a set of 12 black and white sampler blocks. I wanted to add some color, and here is what the finished top looks like. What do you think? Several girls at the retreat thought I should pattern it. Do you think anyone would buy the pattern? NOTE: I didn't design the blocks. I only designed the setting. If I brought it out as a pattern should I include the pattern for the blocks or as a setting for any set of 12 blocks? Need some input on this. Thanks. . . you always give me great advice. This week I have been working on a mini quilt for our Guild Mini Quilt Auction. 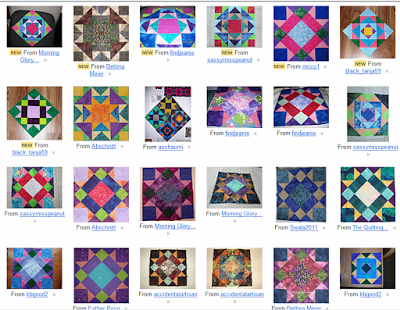 I belong to the Kaw Valley Quilt Guild and our quilt show is April 30, May 1. As the chair of the Mini Quilt Auction I wanted to get a couple of minis made. Here is the first one. The blocks were made by members of the Yahoo Group "Sew Many Swaps" last year in our Midget Blocks swap. These little 4.5" sweeties were so fun to make. As the hostess for this swap I collected a set of "charity blocks" from this swap, and this is the first set that I am putting together to auction at our Quilt Show. The proceeds from the sale of this quilt will go to Women's Transitional Care in Lawrence, KS. I still need to quilt this, but I was thinking of binding it in scrappy 30's binding. I sure have enough scraps left to make plenty of binding. The quilt measure 18" x 23" so it just comes in within the 24" size limit. I made this first one out of the applique blocks in the set. 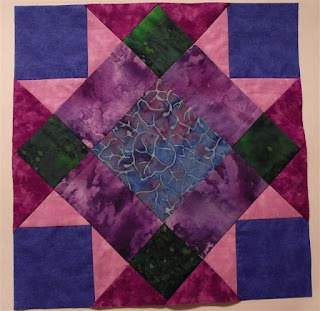 I am going to make several more using the pieced blocks. They are just so darn cute that I am having a blast designing setting for these tiny titans! How do you think I should quilt it??? I was thinking of McTavishing inside each block, stitching in the ditch around each border/sashing, and doing a little leafy vine in the outer border. What do you think? Note. Not all of these are Feb blocks. There were 16 blocks submitted for the February contest and they are all amazing. I just love all the different colors. It hardly seems like it is the same block!!! 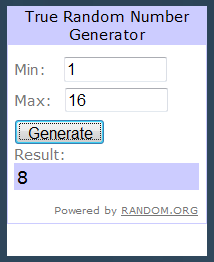 So the old random number generator pulled a winner for me. Send me you address and your prize pack will be in the mail soon!! Thanks to everyone who posted a picture of their block. You are ALL winners in my book!!! Several March blocks are already posted!!! Sew up a March block, post the picture (or send it to me and I will post it for you) to be entered in the March drawing for another great prize pack. Go here: Jewelbom BOM to see all the great blocks and to post your block to be entered to win next month's drawing. OMG I am a Cover Girl!!! I have to tell you I was stunned today when I opened my email. 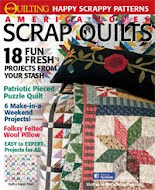 The new issue of Quilter's World Magazine was posted on their website today and as soon as I looked at the cover I screamed. With excitement. My Romantic Posey Table Mat was on the cover. I had no idea!!! I was so delighted I screamed again and immediately printed out a copy of the cover and ran up and down the hall at work screaming "I'm a Cover Girl." Let me tell you, a few of my male students stuck their heads out of the door to take a look!! LOL I am sure they were disappointed although I am not sure what they were expecting. So I have been bouncing off the walls all afternoon just stunned to see my work on a magazine cover. Now I have to tell you, that Brenda Weien, from Brenda's Machine Quilting in Ottawa, KS did the quilting on this, and I am convinced it made the cover because of Brenda's quilting which is drop dead gorgeous on this quilt. They put several good closeup photos of her quilting in the issue so if you get a chance to pick up a copy look closely at her quilting. Her curved cross hatching will blow you away. The pattern fills 8 pages in the magazine and all the templates and foundation patterns are on their website to download if you buy an issue or subscribe. I gotta thank all my buds in Texas: Diane (Quilter's Cabin Retreat), Peggy (Always In Stitches Quilt Shop), Kathi (Hard Candy Quilts), Charm, Mandy, and Deb (Quilters Crossing Quilt Shop) for all their help and support when I made this quilt last summer at Diane's Quilt Retreat in Houston. They gave me lots of great advice and support (along with Father Christmas) as I worked diligently getting this top put together. So just excuse me while I happy dance around the room for a few more minutes. Just talk among yourselves.